On land, in his land clothes, George was a young man who excited little remark. He looked very much like other young men. He was much about the ordinary height. His carriage suggested the possession of an ordinary amount of physical strength. And his forehead struck the happy mean between Bostonian height and Broome Street invisibility. Such was George—on shore. But remove his clothes, drape him in a bathing-suit, and insert him in the water, and instantly, like the gentleman in “The Tempest,” he “suffered a sea-change into something rich and strange.” Other men puffed, snorted, and splashed. George passed through the ocean with the silent dignity of a torpedo. Other men swallowed water, here a mouthful, there a pint, anon, maybe, a quart or so, and returned to the shore like foundering derelicts. George’s mouth had all the exclusiveness of a fashionable club. His breast-stroke was a thing to see and wonder at. When he did the crawl, strong men gasped. When he swam on his back, you felt that that was the only possible method of progression. George came to Ocean City at about five o’clock one evening in July. Ocean City has a well-established reputation as a summer resort, and, while not perhaps in every respect the Paradise which the excitable writer of the local guide-book asserts it to be, on the whole it earns its reputation. Its sands are smooth and firm, sloping almost imperceptibly into the ocean. There is surf for those who like it, and smooth water beyond for those whose ideals in bathing are [not] confined to jumping up and down on a given jellyfish. At the northern end of the beach there is a long pier. It was to this that George made his way on his arrival. It was pleasant on the pier. Once you had passed the initial zareba of fruit stands, souvenir stands, ice-cream stands, and the lair of the enthusiast whose aim in life it was to sell you picture postal-cards, and had won through to the long walk where the seats were, you were practically alone with Nature. At this hour of the day the place was deserted: George had it to himself. He strolled slowly along. The water glittered under the sun rays, breaking into a flurry of white foam as it reached the beach. A cool breeze blew. The whole scenic arrangements were a great improvement on the stuffy city he had left. Not that George had come to Ocean City with the single aim of finding an antidote to metropolitan stuffiness. There was a more important reason. In three days Ocean City was to be the scene of the production of “Fate’s Footballs,” a comedy in four acts by G. Barnert Callender. For George, though you would not have suspected it from his exterior, was one of those in whose cerebra the gray matter splashes restlessly about, producing strong curtains and crisp dialogue. The company was due at Ocean City on the following evening for the last spasm of rehearsals. George’s mind, as he paced the pier, was divided between the beauties of Nature and the forthcoming crisis in his affairs in the ratio of one-eighth to the former and seven-eighths to the latter. At the moment when he had left New York, thoroughly disgusted with the entire theatrical world in general and the company which was rehearsing “Fate’s Footballs” in particular, rehearsals had just reached that stage of brisk delirium when the author toys with his bottle of poison and the stage-manager becomes icily polite. The “Pigskins,” as Arthur Mifflin, the leading juvenile in the great play, insisted on calling it, much to George’s disapproval, was his first piece. Never before had he been in one of those kitchens where many cooks prepare, and sometimes spoil, the theatrical broth. Consequently, the chaos seemed to him unique. Had he been a more experienced dramatist he would have said to himself, “ ’Twas ever thus.” As it was, what he said to himself, and others, was more forcible. 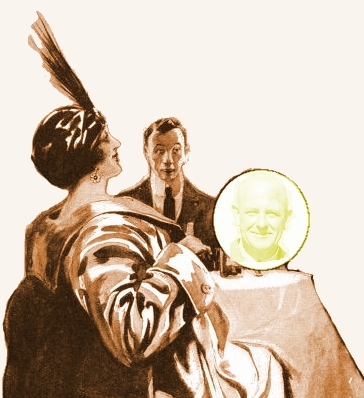 HE WAS trying to dismiss the whole thing from his mind, a feat which had hitherto proved beyond his powers, when Fate, in an unusually kindly mood, enabled him to do so in a flash by presenting to his jaundiced gaze what, on consideration, he decided was the most beautiful girl he had ever seen. When a man’s afraid, shrewdly sings the bard, a beautiful maid is a cheering sight to see. In the present instance, the sight acted on George like a tonic. He forgot that the lady to whom an injudicious management had assigned the rôle of heroine in “Fate’s Footballs” invariably—no doubt from the best motives—omitted to give the cynical roué his cue for the big speech in act three. His mind no longer dwelt on the fact that Arthur Mifflin, an estimable person in private life and one who had been a friend of his at college, preferred to deliver the impassioned lines of the great renunciation scene in a manner suggesting a small boy (and a sufferer from nasal catarrh at that) speaking a piece in the parlor. The recollection of the hideous depression and gloom which the leading comedian had radiated in great clouds flew from him like some grisly nightmare before the goddess of day. Every cell in his brain was occupied to the exclusion of all other thoughts by the girl swimming in the water below. She swam well. His practised eye saw that. Her strong, easy strokes carried her swiftly over the swell of the waves. He stared, transfixed. He was a well brought-up young man, and he knew how ill-bred it was to stare; but this was a special occasion. Ordinary rules of conventional etiquette could not apply to a case like this. He stared. More, he gaped. As the girl passed on into the shadow of the pier, he leaned further over the rail, and his neck extended in joints like a telescope. At this point the girl turned to swim on her back. Her eyes met his. Hers were deep and clear, his bulging. For what seemed an eternity to George, she continued to look at him. Then, turning over again, she shot past under the pier. George’s neck was now at its full stretch. No power of will or muscle could add another yard to it. Realizing this, he leaned further over the rail, and further still. His hat slid from his head. He grabbed at it, and, overbalancing, fell with a splash into the water. George did not struggle. His brain, working with the cool rapidity of a buzz-saw in an ice-box, had planned a line of action. Few things are more difficult in this world for a young man than the securing of an introduction to the right girl under just the right conditions. When he is looking his best, he is presented to her in the midst of a crowd and is swept away after a rapid handshake. When there is no crowd, he has toothache, or the sun has just begun to make his nose peel. Thousands of young lives have been saddened in this manner. How different was George’s case. By this simple accident, he reflected, as, helping the good work along with an occasional surreptitious leg-stroke. he was towed shoreward, there had been formed an acquaintanceship, if nothing more, which could not lightly be broken. A girl who has saved a man from drowning can not pass him by next day with a formal bow. And what a girl, too! There had been a time, in extreme youth, when his feminine ideal was the sort of girl who has fuzzy golden hair and drops things. Indeed, in his first year at college, he had said—and written—as much to one of the type, the episode concluding with a strong little drama in which a wrathful, check-signing father had starred, supported by a subdued, misogynistic son. Which things, aided by the march of time, had turned George’s tastes toward the healthy, open-air girl who did things instead of dropping them. “You’re very wet,” she said. LOOKING round about him, George perceived that sundry of the inquisitive were swooping down with speculation in their eyes. It was time to depart. “We shall,” said George confidently. “I thought you were,” said the girl quietly. The struggle between George and George’s conscience was brief. The conscience, weak by nature and flabby from long want of exercise, had no sort of chance from the start. “I wish you would,” said George. And with those words he realized that he had definitely committed himself. Till that moment explanation would have been difficult, but possible. Now it was impossible. She waded into the water. She hurried into deeper water, while George turning, made his way through a growing throng of goggling spectators. Of the fifteen who got within speaking distance of him, six told him that he was wet. The other nine asked him if he had fallen in. HER name was Vaughan, and she was visiting Ocean City in company with an aunt. So much George ascertained from the management of the hotel. 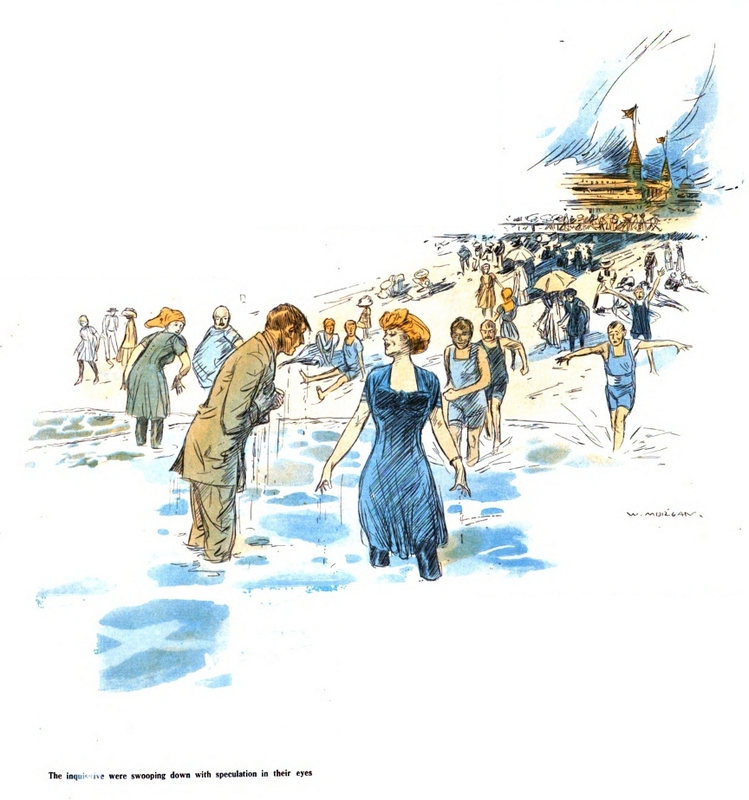 Later, after dinner, meeting both ladies on the board-walk, he gleaned further information—to wit, that her first name was Mary, that her aunt was glad to make his acquaintance, liked Ocean City, but preferred Trouville, and thought it was getting a little chilly and would go indoors. The elimination of the third factor had a restorative effect upon George’s conversation, which had begun to languish. In feminine society, as a rule, he was apt to be constrained, but with Mary Vaughan it was different. Within a couple of minutes he was pouring out his troubles. The cue-withholding leading woman, the stick-like Mifflin, the funereal comedian—up they all came; and she, gently sympathetic, was endeavoring, not without success, to prove to him that things were not as bad as they seemed. “It’s sure to be all right on the night,” she said. “Did you like the story?” he said, tenderly. “Shall we be going back to the hotel?” said the girl. 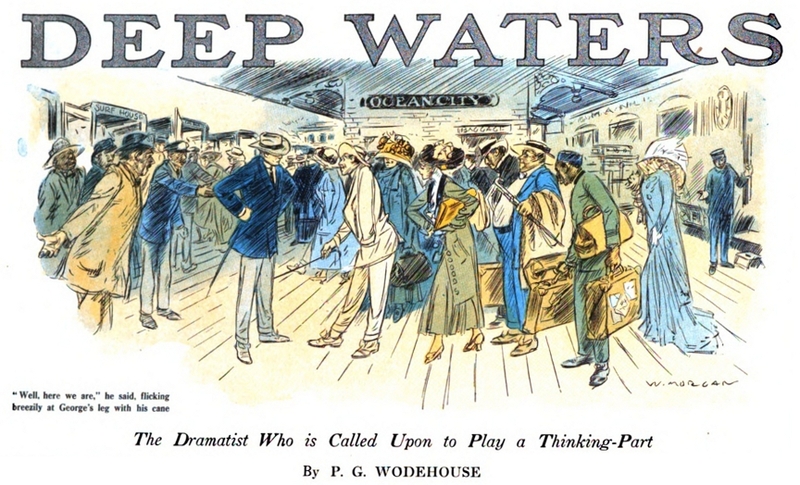 Those noisome creatures, the hired murderers of “Fate’s Footballs,” descended upon Ocean City early next afternoon; and George, meeting them at the station, in reluctant pursuance of a promise given to Arthur Mifflin, felt moodily that if only they could make their acting one-half as full of color as their clothes, the play would be one of the most pronounced successes of modern times. In the forefront gleamed, like the white plumes of Navarre, the light flannel suit of Arthur Mifflin, the woodenest juvenile in captivity. His woodenness was, however, confined to stage rehearsals. It may be mentioned that, once the run of a piece had begun, he was sufficiently volatile. And in private life he was almost excessively so, a fact which had been noted at an early date by the keen-eyed faculty of his university, the discovery leading to his tearing himself away from Alma Mater by request with some suddenness. He was a long, slender youth with green eyes, jet-black hair, and a passionate fondness for the sound of his own voice. “Well, here we are,” he said, flicking breezily at George’s leg with his cane. “I saw you,” said George, coldly, side-stepping. It was Mr. Mifflin’s whim to speak of the “Fate’s Footballs” company as a football team. The center-rush was the comedian, and George had never denied the appropriateness of the name. George thought he had never heard such a vapid, futile remark. “I don’t,” said George coldly. Mr. Mifflin, having remarked “Yeo-ho” in a meditative voice, seated himself at the helm, somewhat saddened by his failure to borrow a quid of tobacco from the Ocean Beauty’s proprietor. For, as he justly observed, without properties and make-up, where were you? Mr. Mifflin uttered a startled exclamation. George woke up. THE quarter-back was the leading woman, she who omitted to give cues. “You do, do you?” said George. George spun round in his seat. Mr. Mifflin’s face was shining with kindly enthusiasm. The shore was at least two hundred yards away, and that morning he had had his first swimming lesson. George came to the surface some yards from the overturned boat, and, looking round for Mr. Mifflin, discovered that great thinker treading water a few feet away. “Get busy, George,” he remarked. It is not easy to shake one’s fist at a man when in deep water, but George managed it. In gloomy silence George gripped him by the elbows. Mr. Mifflin looked over his shoulder. WITH pleasant conversation he endeavored to while away the monotony of the journey; but George made no reply. He was doing some rapid thinking. With ordinary luck, he thought bitterly, all would have been well. He could have gone on splashing vigorously under his teacher’s care for a week, gradually improving till he emerged into a reasonably proficient swimmer. But now—! In an age of miracles he might have explained away his present performance; but how was he to— And then there came to him an idea, simple, as all great ideas are, but magnificent. He stopped, and trod water. Mr. Mifflin pondered once more. Mr. Mifflin pondered for the third time. MR. MIFFLIN’S artistic misgivings as to his colleague’s ability to handle so subtle a part as that of rescued were more than justified on their arrival. A large and interested audience had collected by the time they reached the shore, an audience to which any artist should have been glad to play; but George, forcing his way through, hurried to the hotel without attempting to satisfy them. Not a single silent handshake did he bestow on his rescuer. There was no catch in his voice as he made the one remark which he did make—to a man with whiskers who asked him if the boat had upset. He had just changed his wet clothes—it seemed to him that he had been doing nothing but change his wet clothes since he had come to Ocean City—when Mr. Mifflin entered in a bathrobe. Mr. Mifflin sat down on the bed. Mr. Mifflin’s eyes opened wide. George finished lacing his shoe, and looked up. Mr. Mifflin considered this point. Intelligence began to dawn in his face. Mr. Mifflin contradicted his assertion. THERE was a rehearsal at the Beach Theater that evening. George attended it in a spirit of resignation and left in one of elation. Three days had passed since his last sight of the company at work, and in those three days, apparently, the impossible had been achieved. There was a snap and go about the piece now. The leading woman had at length mastered that cue, and gave it out with bell-like clearness. Arthur Mifflin, as if refreshed and braced by his salt-water bath, was infusing a welcome vigor into his part. And even the comedian, George could not help admitting, showed signs of being on the eve of becoming funny. On the porch of the hotel were a number of easy-chairs. Only one was occupied. George recognised the occupant. “I’ve just come back from a rehearsal,” he said, seating himself beside her. “I thought you might be pleased,” he said lamely. GEORGE heartily commended her good sense. A little chilly did not begin to express it. “Will you have time to give me another lesson to-morrow?” he said. Then he found that in the dim light he had made a mistake. What he had taken for the North Pole was really Vesuvius. Once, in the dear dead days beyond recall, when but a happy child, George had been smitten unexpectedly by a sportive playmate a bare half-inch below his third waistcoat button. The resulting emotions were still green in his memory. As he had felt then, so did he feel now. A warm, prickly sensation began to manifest itself around George’s forehead. “You don’t think!” croaked George. “I think I’ll go for a short stroll,” said George. SCARCELY had he disappeared when the long form of Mr. Mifflin emerged from the shadow beyond the porch. “My name is Mifflin,” said the other, dropping comfortably into the chair which had held the remains of George. The girl inclined her head again, more coldly; but it took more than that to embarrass Mr. Mifflin. Dynamite might have done it, but not coldness. “You were listening?” said the girl scornfully. “Then why did he pretend you had saved him?” she demanded. A WHITE form came to meet George as he reentered the porch. George did not by a good deal; but he understood sufficient for his needs. He shot forward as if some strong hand were behind him with a bowie-knife. “I think I hear aunt calling,” said she. But a benevolent Providence has ordained that aunts can not call forever; and it is on record that when George entered his box on the two hundredth night of that great Broadway success, “Fate’s Footballs,” he did not enter it alone. In the fourth paragraph, the Strand and The Man Upstairs versions have the word “not” which is missing in this magazine version. I have inserted it in brackets here.